Dutch State Visit to the UK - will she or won't she? Wear the Stuart Diamond, that is! The tiara itself is a no-brainer IMHO. She wore that last May when the Luxes came over, albeit in a 'smaller' setting. Wax and Max will visit QEII and family on 23-24 October. It wouldn't be Max if she wasn't going for the full glory this time. She did her test runs by wearing one piece a time in the last two years, so:YES! And it would be fitting. Yaaaaassss please!!! Does anyone know if the Dutch Royal Family has rules about which crown jewels can be worn outside of The Netherlands? At the very least, I hope she brings nothing less than the Dutch sapphire or Mellerio ruby parures (plus a bonkers gown only Maxima can get away with wearing!). Juliana wore the Stuart tiara at Marge's wedding, so bringing it outside the country doesn't seem to be a problem. I want them all, the tiara in the larger setting, the necklace AND the fat bow brooch! If she does not bring the Stuart tiara to UK, then she'd better wear the Mellerio sapphire tiara and in FULL VERSION ! The rule is pretty much: WEAR ALL THE THINGS. In the olden days, the monarch decided who would inherit the house Jewels/family Jewels etc (there's a crown and a sceptre and an orb but they're meh and nobody would want them). Then Willem III's sons died and he and his young wife Emma had a daughter, Wilhelmina, who became queen at the age of 10 and 'took office' when she turned 18. She, too, only had one child, (Queen) Juliana. She had four daughters. Under Dutch law she could not assign all of it to one of the children, so in 1963 she created a foundation to protect the regalia, and in 1968 she created 3 more to protect other goods incl all the jools. There are no restrictions on where to take stuff, since none of it is state owned. While some Jewels were exclusively worn by the monarch (Juliana, Beatrix), all the women in the (extended) DRF can borrow stuff from the vaults. So even while The Bee was queen, her sisters, her daughters in law and the wives of her nephews would wear amazing stuff in exciting variations. Now, Max is president of the foundation, but as her mother in law before, she's very generous in letting the other women have some fun with the shinyyyy. Besides the family stuff, Max (and others) have a nice collection of personal Jewels, like the tutti frutti necklace and bracelet and many of her rings. I'm not sure though if it is safe to say that 'if you've seen in on more than one lady, it's part of the foundation', since they seem to borrow eachother's private stuff too. Still, you won't see Laurentien with the Sapphire or the Mellerio Ruby or the Württemberg. These are more or less queeny stuff, so Max only. The Stuart was never worn in public by Beatrix. To be honest I expected Max to wait with it until a jubilee (25 yr or 10 or so) of Wax's reign to take it for a spin, but hey. it's Max: wear. all. the. things. Still, the pale blue Stuart Diamond itself, we haven't seen that in decades. And yes, they guard a sh*t ton of shiny stuff and other goodies. I live next to the Loo Palace (now museum) built by William and Mary, and though the museum owns many things in there, the DRF also uses it as a place to exhibit foundation stuff. In the olden days, the monarch pretty much decided who would inherit the house Jewels/family Jewels etc (there's a crown and a sceptre and an orb but they're meh and nobody would want them). Then Willem III's sons died and he and his young wife Emma had a daughter, Wilhelmina, who became queen at the age of 10 and 'took office' when she turned 18. She, too, only had one child, (Queen) Juliana. She had four daughters. Under Dutch law she could not assign all to one of the children, so in 1963 she created a foundation to protect the regalia, and in 1968 she created 3 more to protect other goods incl all the jools. Still, you won't see Laurentien with the Sapphire or the Mellerio Ruby or the Württemberg. These are more or less queeny stuff, so Max only. The Stuart was never worn in public by Beatrix. To be honest I expected Max to wait with it until a jubilee (25 yr or 10 or so) os Wax's reign to take it for a spin, but hey. it's Max: wear. all. the. things. Thank you for the link! I pretty much live down in the jewel rabbit holes I get into between links on here and the Order of Splendor/Court Jeweller blogs. 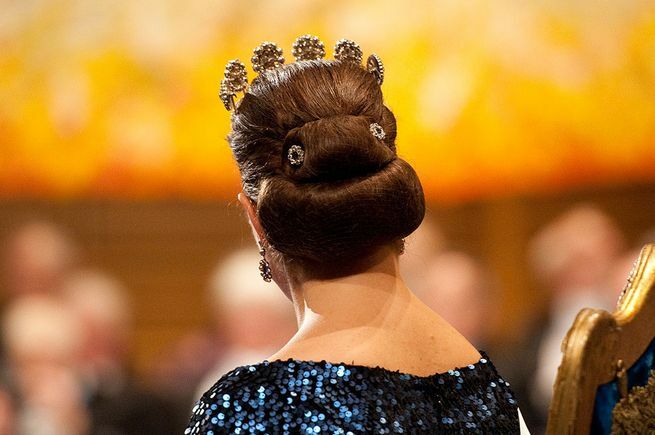 Another question since you are listed as from the Netherlands: Do you think this would be a situation where Dutch citizens might be annoyed/offended if Maxima wears it in front of somebody else first, rather than at home? Excellent summary Pomme! Thank you! It hasn't been worn in public for over 30 years and general opinion when she wore the smaller version (at home) was positive. As in yay finally we get to see it again. I agree, it would be fun to see it again. I'm not too fussed about when she will wear it, I just hope she does and we get to see it. I can't remember if there was a sufficiently big event for a big tiara after Wax took over from his mother. And I have to admit I'm very curious to see what she'll do with it! Please please please. I'm looking forward to this visit for a number of reasons but the top one is a potential Stuart sighting! I agree, this is the BIG one. They're visiting the current longest reigning, most famous Queen, Max needs to go big or go home! In cases like these it's not a sign of show-off, it's a 'only the biggest jewels for the biggest honorees' type deal, right? Even Letizia who can be quite tiara-shy went BIG during the Spain State visit to UK last year with La Buena ! Max has no excuses if she shows up without the big guns ! You can always count on Max to put on the bling - bracelets, pin on the shoulder and waist, earrings, Tiara, the royal order - the whole works. And during the day events throw in some bright coloured outfits with great fascinator and tons of jewellery. Although I do like her in pale colours too. Our girl won't disappoint us. Although she did let me down during Prinsjesdag.